(3) Chronic cutaneous lupus (discoid lupus). All patients with skin lupus need to be monitored for disease inside the body, which can affect the joints, kidneys, lungs, and other organs. Acute skin lupus almost always involves more than just the skin, whereas both sub-acute and discoid lupus, occur only in the skin. This is important because while all patients with skin lupus need to be monitored, many patients with either subacute lupus or discoid lupus go through life without significant disease inside their bodies. Related to someone with lupus. Each type of skin lupus can be triggered and worsened by sunlight. Acute skin lupus most often involves a prominent rash on the cheeks and nose (butterfly rash). Sub-acute lupus most often presents with a red, raised, scaly rash on sun-exposed areas of the body. 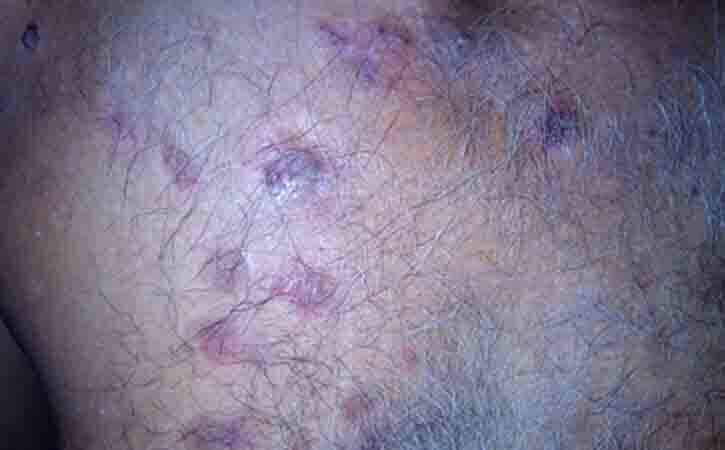 It tends to have circular skin lesions or lesions that can look like psoriasis on sun-exposed skin. Cutaneous lupus starts out as a red to the purple scaly rash on the scalp, face, ears, and other sun-exposed areas. 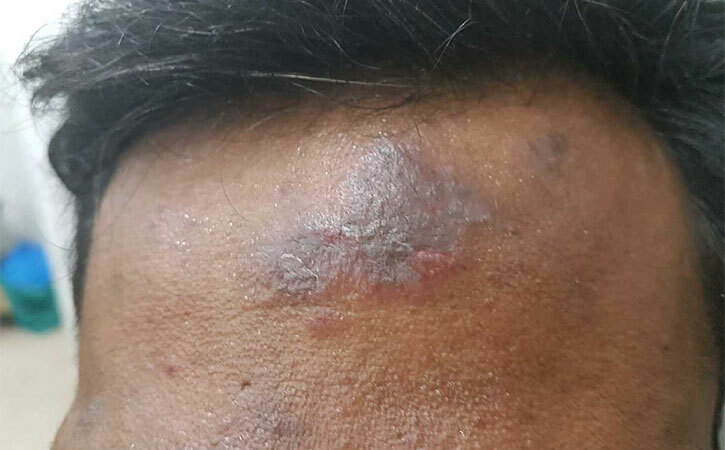 Over time, cutaneous lupus may heal with discolored scarring, permanent changes to the color of the involved skin and even hair loss when the scalp is involved. Occasionally the patches can cause some discomfort and itch. In most patients, there is no effect on their general health. The cause of cutaneous lupus erythematosus is not fully understood but is thought to be an autoimmune disease. We all have an immune system which makes the antibodies that are needed to fight off infections. Normally these antibodies do not attack with the tissues. In an autoimmune disease, the immune system makes a mistake and fights with the body instead. The mistake made by the immune system in cutaneous lupus erythematosus is to view the cells in the skin as foreign and to make antibodies that damage them. Factors that may increase the risk of cutaneous lupus erythematosus or make it worse include stress, infection, and trauma. Some medications are also thought to be a trigger. The condition is not infectious and is not due to food allergy. Cutaneous lupus erythematosus rarely affects children. The goal of treatment is to improve the appearance of the skin, limit scarring, and prevent new skin lesions. Therapy begins with protecting skin carefully from the sun by wearing sunscreen every day. Sunscreen should have a sun protection factor of at least 50, and the label should indicate that it protects against both types of sunlight (UV-A and UV-B). Apply plenty of sunscreen 15 to 30 minutes before going out in the sun. It is also color to wear sun-protective clothing and a broad-brimmed hat. People with skin lupus or systemic lupus should try to stop smoking because smoking may worsen their disease. Medical treatment for lupus affecting the skin begins with creams or ointments and an oral medication called hydroxychloroquine. If skin lupus is still active after using these treatments, consultant may consider other medications. Treatments help to control the disease, but there is no permanent cure for skin lupus, so it is important to see consultant regularly. When suspected symptoms arise, must consult with a consultant. The consultant will analyze first then counseling with the patient. The consultant will start treatment as soon as possible. Treatments help to control the disease, but there is no permanent cure for skin lupus, so it is important to see consultant regularly.